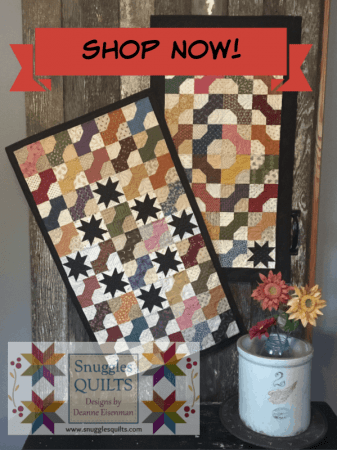 Applique Tips – How to make stems! 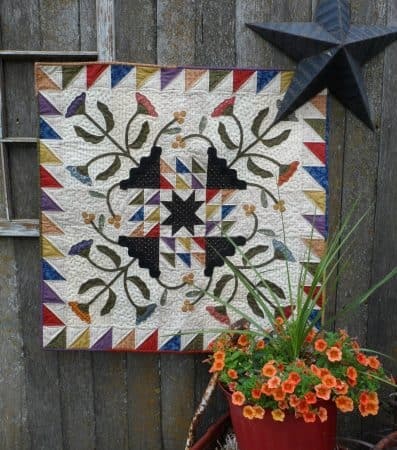 Have you ever admired a quilt with a beautiful appliqué motif and said: “I want to do this!”. Well, I hope you have. Needle-turn hand appliqué has been a passion of mine for almost as long as I have been quilting. Now, I know many of you do not like hand work and are afraid of the “A” word. But you don’t have to be! You can do your appliqué by machine. 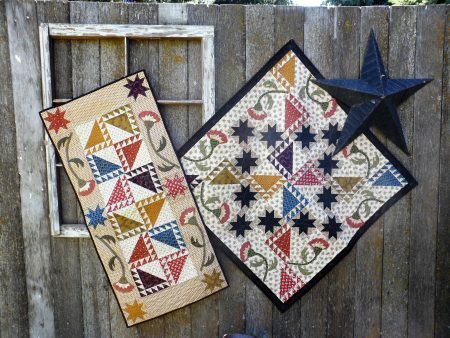 I just love the added something that appliqué gives to a quilt top, whether it is pieced or just a plain background. 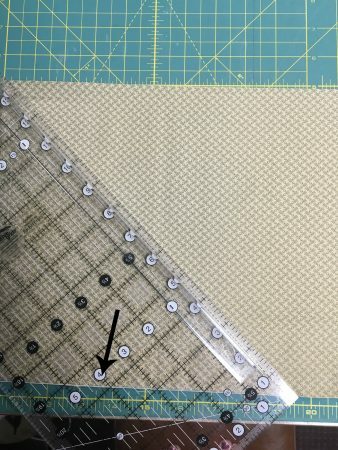 I have done appliqué posts in the past talking about many of the different steps for doing hand appliqué but have never done a full post on making stems. So, here you have it …. a blog post on stems! 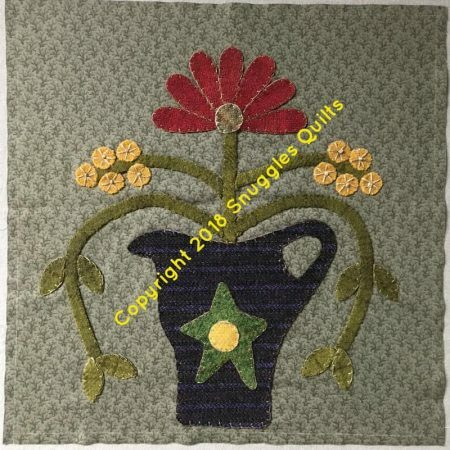 If you are interested in appliqué instruction from start to finish, consider purchasing my video class Sew on the Go with Needle-turn Hand Appliqué. Once purchased it’s yours to keep forever! I like to create my stems from bias cut strips since those are easier to manipulate into curves than straight cut strips. I usually use either a fat quarter or fat eighth depending on how many stems I need. Here is how to cut bias stems. Then measure and cut out the amount of strips you need. 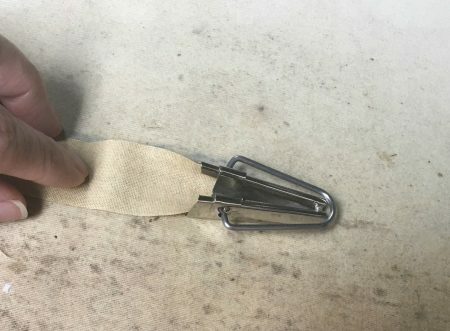 If you need stems longer than the strips produced, you may have to stitch a few strips together before preparing them into stems. Cut your strips 1/2″ wider than the width of your finished stem. 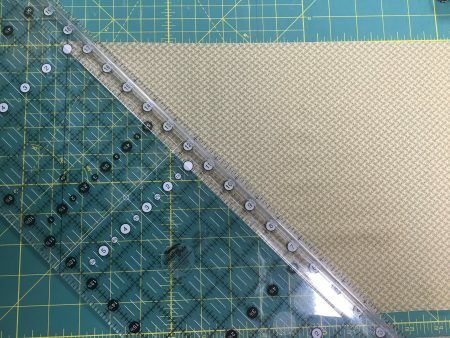 For example, if you want 1/2″ stems you need to cut your bias strips 1″ wide. Now it’s time to prepare the strips into stems. To do this, I use a bias tool. They come in sizes from 1/4″ to 1″. 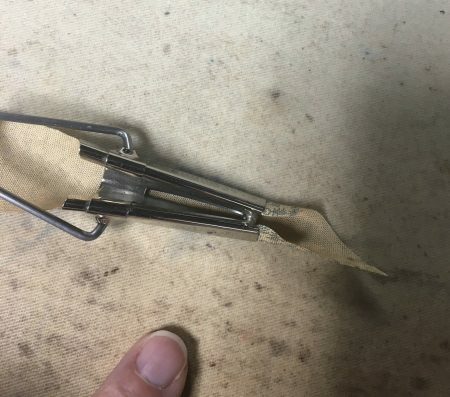 The size of the tool in the finished size of the stem. So, for a 1/2″ stem, we will use a 1/2″ bias tool. Feed the strip, right side of fabric down, into the larger end of the tool until it comes out the smaller end. 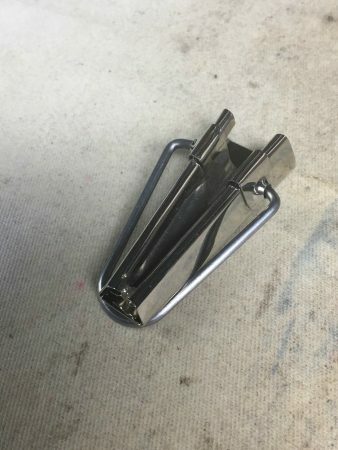 When it comes out of the end, the sides of the strip will be folded over as shown. Use the iron press this fold all the way down the strip to make the stem. Stems are usually stitched onto the project first because they are usually covered with flowers and leaves or other parts of the appliqué motif. So, that’s making stems! Not very hard to do and they add so much to an appliqué design. 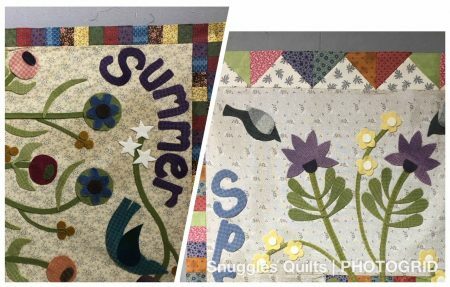 Leave a comment below in this blog post on your favorite type of appliqué project and win a free pattern for my newest design Summer Serendipity. Wool Applique is Fun! BOM Block 6 and Some Tips for You. Hi everyone! Well, this week, summer officially arrives even though it’s been in the 90s here all weekend. I wanted to share a photo I took today. 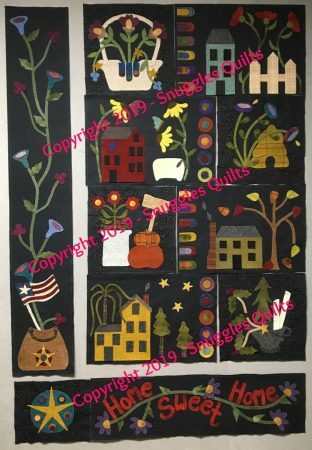 It is of one of my colorful gardens that inspires my quilting every day. 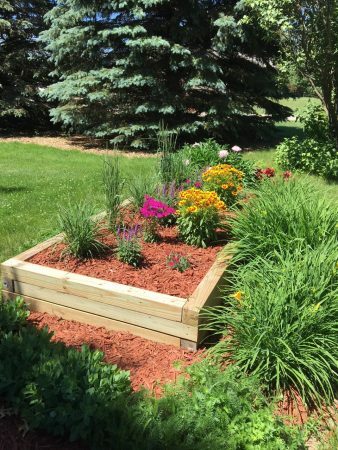 Gardening is what I like to do when I’m not quilting. I think it recharges my batteries and it doesn’t hurt to enjoy a little fresh air! What inspires you? When it’s this hot, I bet the last thing you want to think about is wool! But, wool applique is fun and also portable. So you can take it outside under that shady tree in your yard and stitch to your heart’s content! Go to the BOM page to be directed to the pattern. If you’d like to receive the pattern early every month, sign up to receive my monthly newsletter. You’ll find the sign-up on the side bar to the right on this page. Now on to something new. Here’s a sneak peak of two of my current wool applique projects. They are wall hangings for each season of the year! I can’t wait until they are all done and I can share the complete photo with you. For know, I just wanted to whet your appetite. 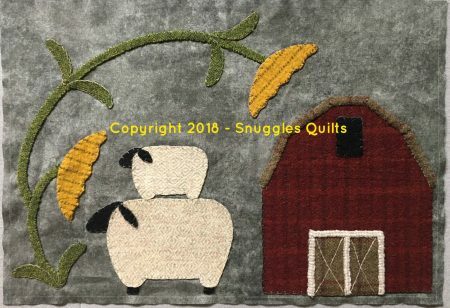 So now on to some of my favorite wool applique tips. Tip #1: As you can see, my wool applique is done on cotton. Either a plain or pieced background. When choosing your wool for a project, be sure that it has good contrast with the background. You want to be able to see the motif. See the yellow flowers on the banner on the right? Those were going to be white. But when I held the white wool up to the background, it disappeared! So, I chose the yellow wool for the flowers and used the white for the center. Tip #2: Use fusible web such as Heat ‘n Bond Feather Lite. Using this and fusing it to the wool helps the appliqué piece its shape and stabilizes the wool more for stitching. Trace your applique motif on the paper side of the fusible, cut the shape out slightly outside of your drawn line and fuse onto your wool. Then use the drawn line to cut out your applique motif. 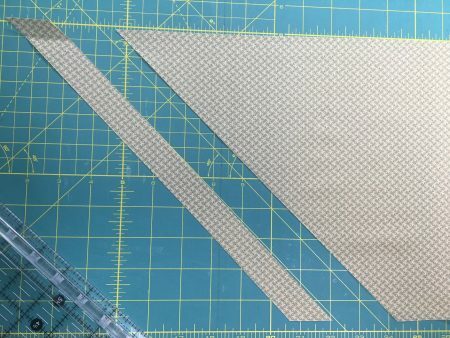 Be sure to reverse non-symmetrical applique templates when tracing onto the fusible so they are facing in the correct direction once the motif is fused and cut out of the wool. 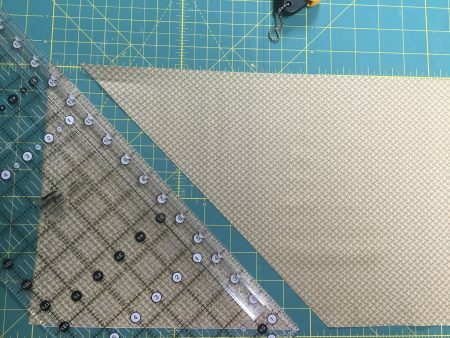 Tip #3: You can either affix the pieces to the background using fabric glue, like Roxanne’s Glue Baste-it, small appliqué pins or fuse the pieces to the background by ironing. If you choose the latter, lay a towel on the ironing board, then lay your background down and then place the wool pieces in place on the background. Then carefully, so you don’t move any of the appliqués, place a white towel over the project and spray water over the towel using a spray bottle. 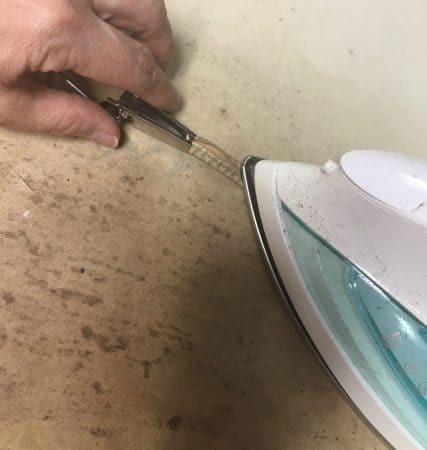 With a medium/high iron, press the towel to fuse the pieces on the project underneath. Periodically lift the upper towel and check pieces to see if they are fusing. The towel below the project will keep your wool from “flattening” out. Size 22 is a little longer than the size 24 needles. Try the ones that work best for you. I use Valdani Perle Cotton size 8 threads for stitching. 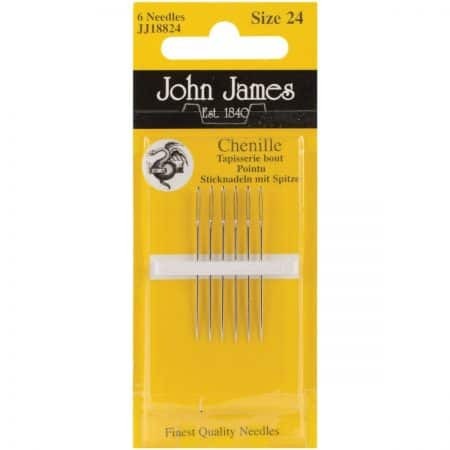 These needles work great with perle cotton threads. Depending on the project, I will use a contrasting thread if I want a primitive look and want my stitching to show. If I want my stitches less visible, I will match the color of the perle cotton to the wool applique. Tip #5: Good lighting! It’s best to have good lighting when you are stitching. You need to see to make your stitches the best you can! I have a great table top light I like to use: Naturalight by the Daylight Company. 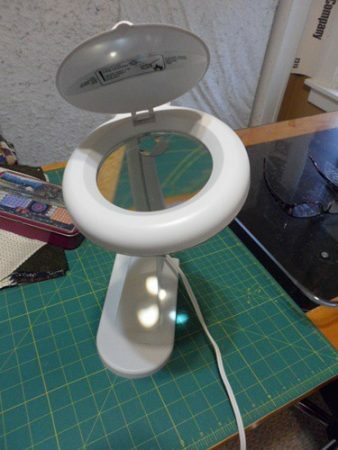 It’s bright and also has a flip up top to reveal a magnifier. So now you’re ready to do some wool applique! You can start with my free BOM and work your way up to larger projects as you get more comfortable with stitching. Do You Like to Travel Stitch? I don’t know about you, but I like to stitch on projects outside or on the road. I usually have more than one project going on at a time for that very reason. 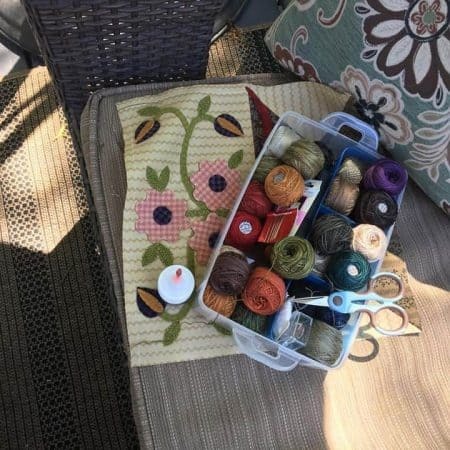 Obviously, I can not have my sewing machine outside on the porch or in my car (…. at least not yet! LOL! 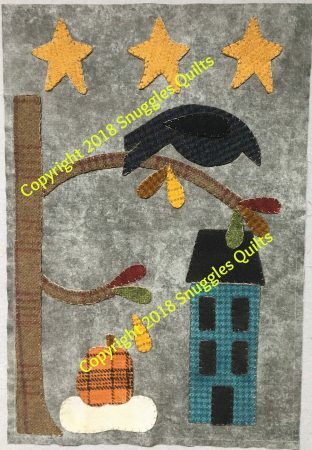 ), so I have a project in the works that requires the sewing machine and then I have one or more hand projects, either wool or needle-turn applique. Then I have my bases covered and my hands are not idle on a road trip. I just can not sit in a car and not be reading or stitching! To take a project with me on the road, first I have to have a way to store all the pieces so I do not lose anything. 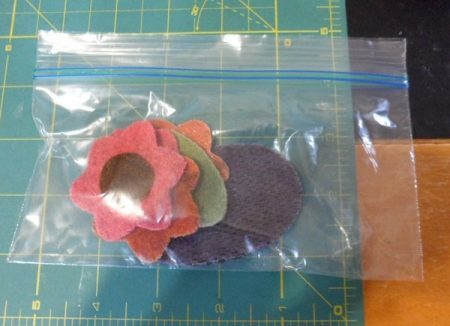 I use small zip lock baggies, either snack, sandwich or quart size (depending upon the size of my project) to store my appliqué pieces. This also works for wool appliqué, hexies or other hand projects! Then I use a larger “project bag”. You know those plastic bags with zippers that small sheet sets come in? They are perfect to pack a project into. 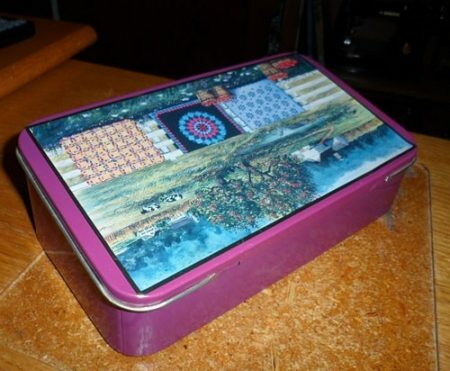 enough room to fit your project and sewing supplies you will need such as rulers, thread and needle storage, etc. These bags work great for plane trips too. 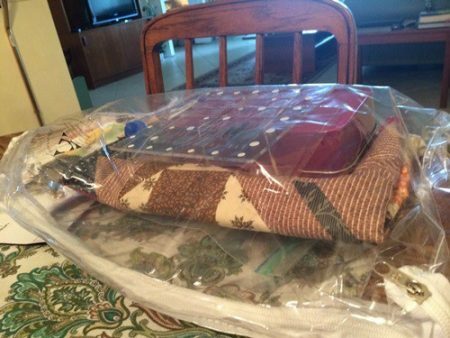 Since it is not hard sided, the bag of supplies is easy to squeeze into a suitcase. Notice the magnet in the corner. I found this magnet “block” at my local hardware store. It fits right inside my tin and holds needles, a small scissors and some pins. A lot better than having them rolling around inside the tin! 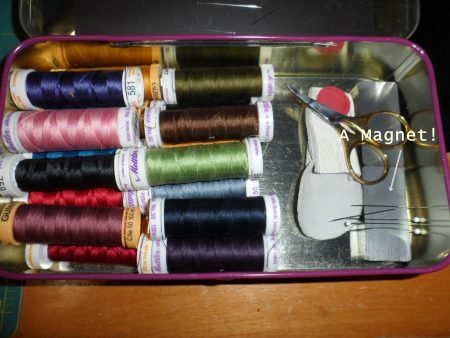 Next is the plastic container that holds my wool applique threads. 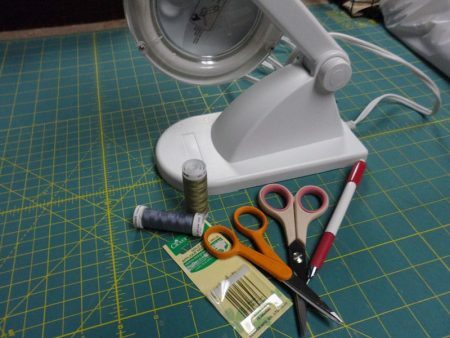 I use this for travel sewing and for my summer days “porch stitching”! This is a Snapware container that has a few levels that all snap together and have a cover. I love this for travel! 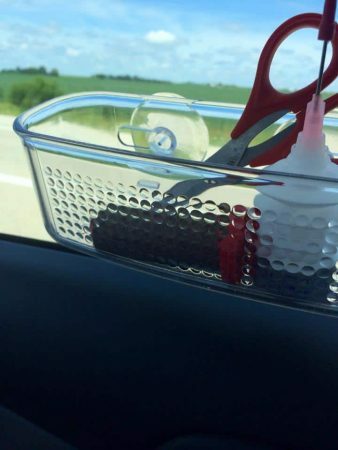 Next, I needed a place to put sewing supplies within reach when I am sewing in the car. I got this idea from a student in one of my classes. Go to the bathroom section of a Target, Wal-Mart or similar store and look for these small suction cup storage items. If you can not find one there, find it here. I think they are used in a shower to hold soap. 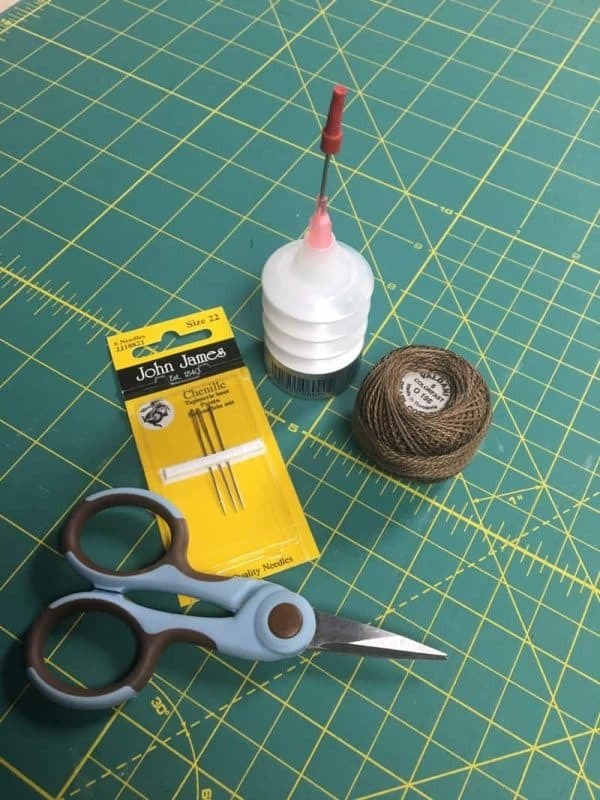 I stick it on the car window and store my thread and scissors so they are easy to reach! Isn’t it amazing what you can do with everyday items? So, I’m packed and ready for my next car trip at any time. I better get going on some ideas so I have something to work on for my next car ride. Summer is coming and the kids are miles away, so I’m sure there will be road trips in my near future! Block #4 of my 2018 BOM! 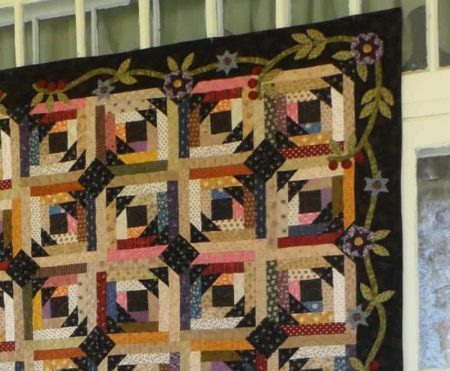 Do to the Block of the Month page to get the free pattern! Block #2 of my 2018 BOM is Here! It’s the 15th of the month and you know what that means …. 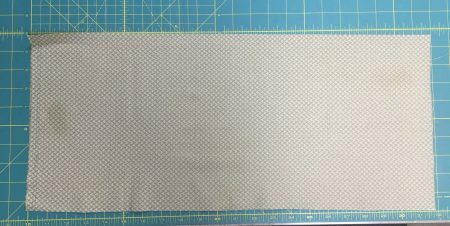 the reveal of the next block of the month block for my 2018 BOM. This block is a cute farm scene that reminds me of spring. Blooming flowers and new babies on the farm! 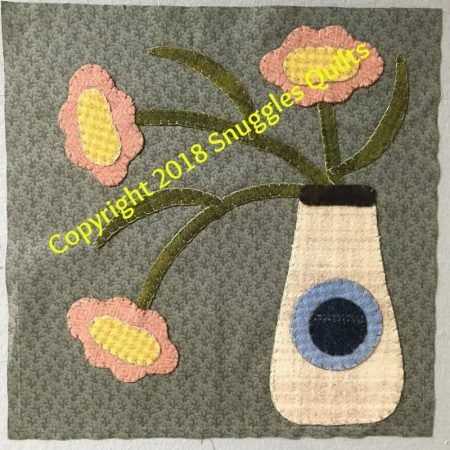 Go to the Block of the Month page for the link to the pattern. Enjoy stitching this fun block this month!